DICI: How did the General Chapter go? How was the mood of the meeting? 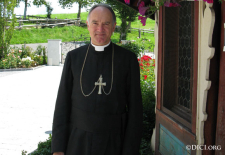 Bishop Fellay: It took place in a rather hot atmosphere, since July is a particularly hot month in the Valais! But in a very busy schedule, where the members of the Chapter were able to freely exchange ideas, as it befits such a working meeting. DICI: Were you able to discuss the relations with Rome? Were there any forbidden questions? The dissensions manifested within the SSPX these last months, have they calmed down? Bishop Fellay: That makes for quite a few questions! Regarding Rome, we went to the very heart of the issues, and all the capitularies were able to study the complete file. Nothing was left aside and there were no taboos among us. It was my duty to exhibit with detail all the documentation exchanged with the Vatican, something which was rendered difficult by the obnoxious climate of recent months. This made it possible for us to conduct direct discussions which have cleared out the doubts and dissipated any misunderstandings, resulting in peace and unity of hearts, which of course is something to rejoice about. DICI: How do you foresee the relations with Rome after this Chapter? Bishop Fellay: All ambiguity has now been resolved among us. Very soon we will convey to Rome the position of the Chapter, which has been the occasion to specify our road map insisting upon the conservation of our identity, the only efficacious means to help the Church to restore Christendom. As I told you recently, “if we want to make fruitful the treasure of Tradition for the benefit of souls, we must both speak and act” (cf. interview of 8 June 2012, DICI #256). We cannot keep silent when facing the rampant loss of faith, the staggering fall of the number of vocations, and the decrease of religious practice. We cannot refrain from speaking when confronted with the “silent apostasy” and its causes. Doctrinal mutism is not the answer to this “silent apostasy” which even John Paul II denounced already in 2003. DICI: What are your thoughts on the appointment of Archbishop Mueller as Prefect of the Congregation for the Doctrine of the Faith? Bishop Fellay: It is nobody’s secret that the former bishop of Regensburg, where our seminary of Zaitzkofen is located, does not like us. After the courageous action of Benedict XVI on our behalf, in 2009, he refused to cooperate and treated us like as if we were lepers! He is the one who stated that our seminary should be closed and that our students should go to the seminaries of their dioceses of origin, adding bluntly that “the four bishops of the SSPX should resign”! (cf. interview with Zeit Online, 8 May 2009). DICI: How do you see the future of the SSPX? In the midst of its fight for the Church’s Tradition, will the SSPX keep to the same knife’s edge? Bishop Fellay: More than ever we must maintain the knife’s edge traced by our venerated founder. It is not easy to keep, yet absolutely vital for the Church and the treasure of its Tradition. We are Catholic, we recognize the pope and the bishops, but above all else we must keep intact the Faith, source of God’s grace. Therefore we must avoid all that may endanger the Faith, without trying to become a replacement for the Church, Catholic, Apostolic, and Roman. Far from us the idea of establishing a parallel Church, of exercising a parallel magisterium! This was well explained by Archbishop Lefebvre more than thirty years ago: he did not wish to hand down anything else but what he himself had received from the Church of two millennia. This is what we want also, following his lead, so that we may effectively help “to restore all things in Christ.” It is not us who will break with Rome, the Eternal Rome, mistress of wisdom and truth. Nevertheless, it would be unrealistic to deny that there is a modernist and liberal influence in the Church since the Second Vatican Council and its subsequent reforms. In a word, we maintain the faith in the primacy of the Roman Pontiff and in the Church founded upon Peter, but we refuse all which contributes to the “self-demolition of the Church” acknowledged by Paul VI himself since 1968. May Our Lady, Mother of the Church, hasten the day of its authentic restoration!